Larry Bird – Legend of the Ball. An interview. Larry Bird is one of the greatest to ever play the game. Originally published in SLAM 118. You can read the article, with over 100 comments, at Slam Online. 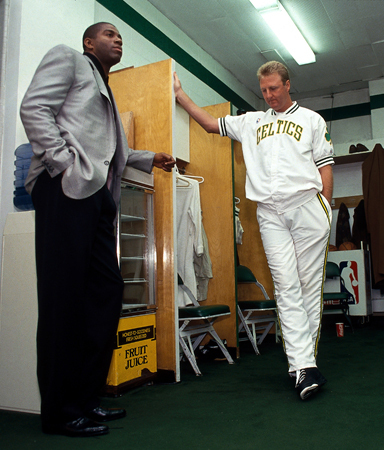 The Legend of Larry Bird is so great that it’s easy to lose sight of the basketball player who helped revitalize the NBA while starring for the Celtics from 1979 to ’92. The NBA was at a low point, a distinctly minor major sport, when Bird and his doppelganger Magic Johnson came to the League after squaring off for the NCAA title in a hugely hyped and widely watched game. Bird and Magic immediately brightened the fortunes of professional hoops, revitalizing two of the NBA’s most storied franchises. 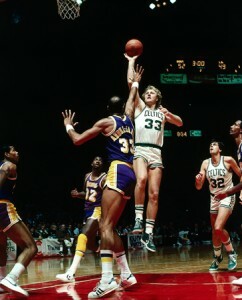 In the years to come, Bird’s Celtics won three titles (’81, ’84, ’86) while Magic’s Lakers won five, in a gripping decade-long rivalry that captivated millions of old and new fans. As a white man playing in the whitest of major American cities and starring in a game increasingly dominated by black men, Bird became a great white hope. Some thought he could do no wrong; others were sure that he could do no right. Many saw a symbol instead of a man and they viewed him on the court through this prism. And that is a shame, because it obscures the cold, hard facts of how great Bird was and how much fun it was to watch him play. The remarkable numbers begin to tell the story: three consecutive MVPs, two-time Finals MVP, nine straight All-NBA first teams, career averages of 24.3 ppg, 10 rpg and 6.3 apg. But they are just the outline. Bird played with supreme confidence and his own kind of definitive, endless grace. He could control a game in every possible way—scoring, passing, rebounding or defending. Bird could score inside or out, break your will with a rebound in traffic, a thread-the-needle pass or an eyes-closed three pointer. And he played with a manic intensity and endless hustle. You couldn’t take your eyes off him. Teamed in Boston with Kevin McHale and Robert Parish, Bird helped form one of the best frontlines ever. They peaked in ’85-86, going 67-15, including a 40-1 home record. They rampaged through the Playoffs that spring, going 15-3. Bird bagged a triple-double (29 points, 11 rebounds, 12 assists) in the Game 6 clincher against the Houston Rockets to win his third NBA Championship. Bird was just 30 but he had a lot of mileage. He never won a fourth ring, but he was far from done. He averaged a career-high 29.9 points in ’87-88, and became the first Celtic to record a 40-20 game, with a 42-point, 20-rebound performance. The next year he had surgery to remove bone spurs in both heels and only played six games. He returned for 1989-90, averaging 24.3 ppg, but then his back began giving him problems. He played just 60 games in ’90-91 and 40 the following season after an operation failed to stop the pain from a swollen disc. As co-captain of the original Dream Team in ’92, Bird helped the US win gold in Barcelona. A few weeks later, he retired. Having coached the Indiana Pacers to the NBA Finals in 2000, the 51-year-old Bird is now the team president. But when we got him on the phone, the convo stuck to the glory days. SLAM: When did it first strike you that you had an opportunity to be really good at basketball? BIRD: Not until I got to the pros. SLAM: That’s hard to believe. BIRD: I really didn’t. I have always been confident in my skills and once the game got going I knew I was probably the best player on the floor most of the time whether it was junior high, high school or college. I knew I had control of the game. But I still didn’t know what it meant because I went to such a small high school and college. SLAM: You started school at Indiana under Bob Knight and left in less than a month. Did you have a problem adjusting socially, academically or basketball-wise? BIRD: It was all money. My parents couldn’t afford it. I had a free ride scholarship but I had no money for anything else, nothing to live on. My folks couldn’t give me any money at all, so I left after three or four weeks. It was tough. I went back to French Lick. I worked at a company that built motor homes and worked at a boys club and then for the town. I did that for a year and then went to Indiana State. 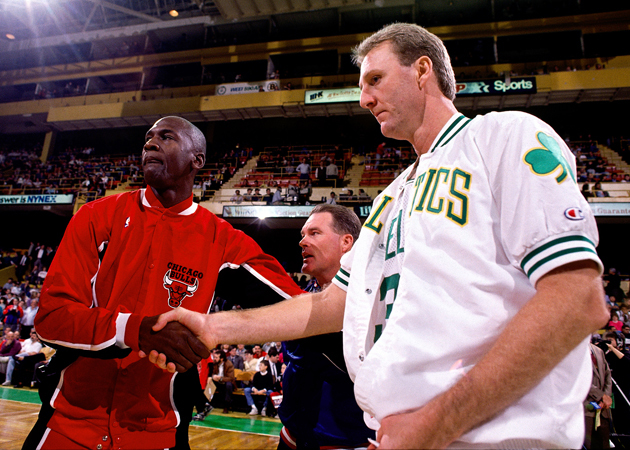 SLAM: You won three rings in the NBA—was any one of them more memorable than the others? BIRD: They all were memorable. Our ’86 team was probably the best and we knew it could be that from training camp on. But I don’t really remember the wins. I remember the losses. That’s what I carry with me. I always expected to win. I can remember ’87, when we lost to the Lakers in six after McHale got hurt. If he stayed healthy, maybe we win. We got beat in ’85 by them when we lost a home game we should have won. Them games stick out more than any of the wins. They stick in the gut. SLAM: You once called the late Dennis Johnson your greatest teammate. Why did you like playing with him so much? BIRD: I called him one of my greatest teammates, and it was because DJ was just special, a two guard who could get the ball up the court, hit a shot or find an open man and defend anyone. But what really elevated him was the fact that in big games, he was always the guy who had the ball in his hand while also guarding their best player. During the regular season he always did well but in the Playoffs he stepped it up and the bigger the game, the more ready he was to go. I really respected that. Me and DJ had a bond. I sort of knew what he was thinking and I just loved playing with him from the moment he arrived in Boston [in ’83]. SLAM: One of the great examples of your chemistry was when you broke the hearts of every Pistons fan and Celtics hater in the world, stealing the ball from Isiah Thomas and passing to DJ for the winning layup in Game 5 of the ’87 Eastern Finals, just when you seemed about to pass the torch to Detroit. SLAM: You had tremendous rivalries with the Sixers, Lakers and Pistons, and each team had continuity from year to year, with the same core players. Do you gain a lot by keeping a core together for a long time? BIRD: There’s no question about it. You build a commitment to each other and an understanding and new guys coming in to fill roles pick up on it and find their places more easily. Also, the more you win, the better you’re gonna get. It grows on itself. We played together really well and had great ball movement and that’s the kind of stuff that gets easier and easier with familiarity. I played with McHale and Parish for 11-12 years, DJ for 6-7. Our core group was very stable for a long time. We were pretty close in the sense of really knowing each other on the court and having close basketball relationships. SLAM: Did that transfer off the court? BIRD: As far as being professional, yeah, but going out to eat all the time, no. It wasn’t like that and it doesn’t have to be for a team to be close. That’s a misunderstanding. I remember one time Robert saying, “When my career’s over, I don’t want to see any of you guys ever again.” We spent a full nine months together pretty intensely every year. SLAM: Your career is so linked to Magic’s. He once said that he needed you and you needed him. Do you agree with that? BIRD: Yeah. I followed everything he did and I know he did the same with me. He was on the best team in the West and I was on the best team in the East, which brought a lot of tension to the game. It carried right over from college to the NBA. When we came to the NBA it wasn’t all that respected because it was not really a team game at that point. It was more about individuals. Then you have one 6-9 guy playing point guard and another playing small forward. Both of us passed and got everyone involved. We thrived on a team game. SLAM: When you came to the League, Dr. J was the premier forward. Did you enjoy going against him? BIRD: I always felt it was a great honor to play against his teams and obviously he was the focal point, so I knew I had to be ready and that probably whichever of us played the best was going to win. We always had to go through Philadelphia and we knew it was going to be a battle. Doc was long and athletic. He was a great open court player and a great scorer and he had a lot of talent around him, with guys like Andrew Toney, Bobby Jones and Maurice Cheeks, so if you overloaded to stop him you’d get burned. SLAM: And then he got Moses Malone. BIRD: Oh yeah. We played against Moses in Houston when he and Cal Murphy carried that whole team to the [’81] Finals and going to Philadelphia with what they already had there, you knew that it was going to be a very tough situation. He was such a relentless player. He’d throw it up and go get it, get your big men in foul trouble. For a team that good to be able to pick up another player that good was a little scary. They had one of the best teams ever in ’83. SLAM: How important were Bill Walton’s contributions to the great ’86 team? BIRD: Very important. He finished a lot of games for us. He and Robert split time and they were very good friends, so there was no animosity. Everyone wants to play but in situations like that everyone has to be an adult. KC [Jones, coach] stayed with him and kept that situation—and many others—under control and from ever becoming a problem. SLAM: KC’s often been disrespected as a coach, accused of just rolling out the balls and winning because he had so much talent. BIRD: You can say that about Phil Jackson, too—and people do—but I know better in both cases. We worked very hard in practice and KC kept the locker room at peace, played guys when they played well. I think he did an excellent job at Xs and Os too, but people overlook the importance of managing your team. Keeping guys who think they should be starting on board, keeping guys who start but feel they should be stars playing hard, keeping everyone on the same page and working together—all of that is hard work and KC was great at it. SLAM: How big of a home court advantage was the Boston Garden for you guys? BIRD: It was big, but I always thought that the great players could play at home or on the road. Anyone can play at home when you have the crowd patting you on the back. Everybody’s more relaxed and active. On the road it’s more difficult and it’s more important—good teams are going to win most of their home games. So I focused on doing whatever was needed on the road, and that usually meant more rebounding and more effort getting other guys involved. If a big shot came up and we needed it, I’d be looking for it but I always focused on other things than scoring first on the road. SLAM: At the Garden it always seemed like the air conditioning would suddenly be broken when it was 95 degrees out and you guys would be ready with new uniforms at half and things like that. How much of an aid did Red Auerbach give you guys with these types of legendary ploys? BIRD: We didn’t have real air conditioning in the Garden, so when it’s hot out, it’s gonna be hot in there. I don’t think it played a big factor. Growing up, I played on the asphalt when it was 95 degrees. To me, it was nothing and I wasn’t alone. It helps to be at home, but I think Red’s “tricks” have all been overplayed. They helped more because people talked about them more than anything real. SLAM: How much has the League lost with the replacement of places like Boston Garden and Market Square Arena? BIRD: A lot. It’s sort of sad. Chicago Stadium is another one. It’s a money thing. Market Square Arena didn’t have any suites and it’s impossible to survive in a place like that now. Things have changed. Boston Garden was a great place to play but it held 15,500 and didn’t have all the suites and amenities you need today. To keep up they had to have a new arena. SLAM: It seems like every talented white player over 6-3 is compared to you. Do you tire of this? BIRD: I don’t really pay attention to it. When I came into the League, I was getting compared to Rick Barry and I thought that we didn’t have that much in common and that I hadn’t accomplished anything yet while he had had a great career. It wasn’t really fair to either of us. I’d say the same thing about comparing a young player to me. Larry is a great guy !